Okay, I confess. I didn’t really come up with this pasta dish on my own. 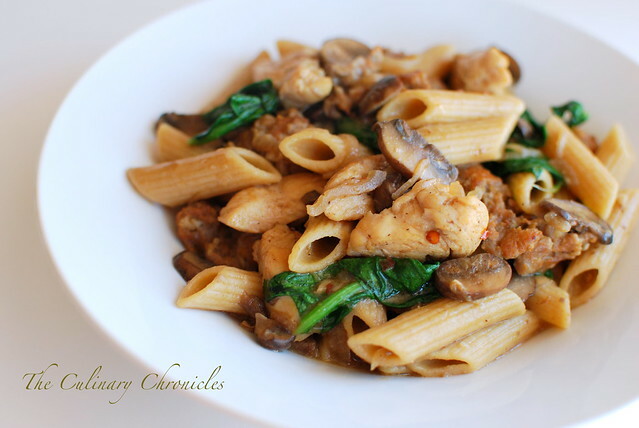 It’s actually my interpretation of Pasta Pomodoro’s Penne Portobello which I just L-O-V-E.
Italian Sausage, chicken, mushrooms—all in a garlicky cream sauce. How could it not be Delizioso? In addition to the criminis, I used porcini mushrooms and its liquor for an extra level of earthiness to the dish. I also threw in fresh arugula leaves at the very end for a bit of freshness and peppery flavor. And although this is technically a cream sauce, you’d be surprised how light it all was. Bring a large pot of water to boil. Add salt and cook the penne pasta just shy of al dente. Place the dried Porcini in a bowl with the hot water. Allow the mushrooms to reconstitute—about 10 minutes. Squeeze out extra liquid from the Porcinis (saving the liquid) and roughly chop them. Heat olive oil in a very large heavy pan (or pot) over medium-high heat. Season chicken with salt and pepper. Add Italian sausage to the pot and use a wooden spoon to crumble the meat and break into small pieces. Once the sausage is barely pink, add the chicken. Continue cooking until both are done. Use a slotted spoon and transfer it to a plate covered with paper towels. Using the same pan, lower the heat to medium and sauté the shallots until translucent. Add garlic, chili flakes, and both mushrooms. Cook until the mushrooms are tender. Stir in wine and liquid that the porcini was reconstituted in–being careful not to add in the mushroom grit/sand. Raise the heat to medium-high and cook the liquids until it is reduced by half. Stir in the cream and cook for an additional 1-2 minutes. 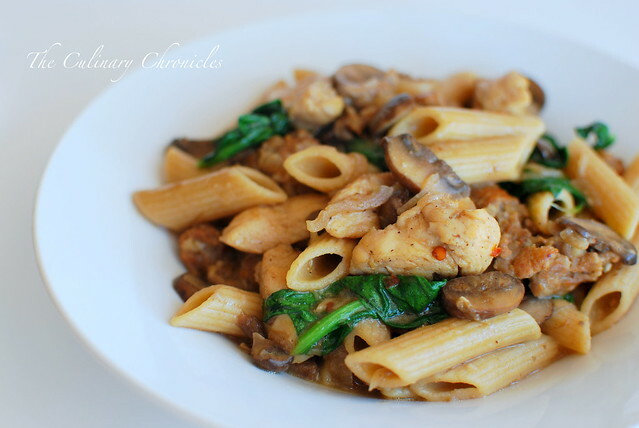 Return the sausage and chicken to the pot and add the cooked penne. Stir until all the penne has been coated. Season with salt and pepper to taste. Remove pan from the heat and toss in the arugula leaves. Toss until the leaves are just wilted. Serve and Enjoy! Oh wow! I LOVE Penne Portobello too!!!! I need to try this soon! Great! Two and a half thumbs up! I tried this whenever I found this recipe last summer and it was amazing! Not hard to make and everyone loved and I had no leftovers to take to work with me the next day 😦 Anyway, the recipe must have fallen behind something because I totally forgot about it until I happened back on your self site today. Now I’m bookmarking you!! facts concerning my presentation topic, which i am going to convey in college.